Mother’s Day should probably be every day. But unfortunately it only comes around once a year. It is the day we all say thank you to Moms everywhere. Next weekend is Mother’s Day. Let us all do something special to thank all those Mothers who have been there to help us and see us through our problems. The origin of Mother’s Day goes back to the era of ancient Greek and Romans. 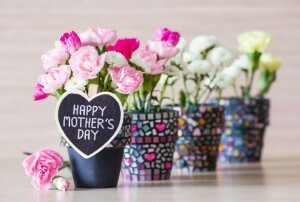 But the roots of Mother’s Day history can also be traced in the United Kingdom where a “Mothering Sunday” was celebrated much before the festival saw the light of the day in the United States. However, the celebration of the festival as it is seen today is a recent phenomenon and not even a hundred years old. Thanks to the hard work of the pioneering women of their times, today the celebration of Mother’s Day spans 46 countries (though on different dates) and is a hugely popular affair. Millions of people across the globe take the day as an opportunity to honor their mothers and thank them. Thank them for their efforts in raising them and being their constant support and advocate. The earliest history of Mother’s Day dates back to the ancient annual spring festival the Greeks dedicated to maternal goddesses. The Greeks used the occasion to honor Rhea, wife of Cronus and the mother of many deities of Greek mythology. We at the orthodontic office of Lisa P. Howard DDS MS would like to recognize the efforts and sacrifices of Moms all over the world this Mother’s Day. If it wasn’t for those Moms, most kids and teens would be hard pressed to keep up with all the instructions needed to achieve a great orthodontic result and smile for a lifetime. Kids can’t wait to get their braces on and then soon thereafter, they can’t wait to get them off. In between, Moms are the angels who make things happen and get the job done day to day. And sadly, sometimes they are taken for granted. To learn much more about Mother’s Day and Moms everywhere, visit this Mother’s Day site. At orthodontic office of Lisa P. Howard DDS MS, we APPRECIATE you!